Give it enough time and things in life tend to work themselves out. And hope springs eternal once you lay your eyes on the all-new St. Croix Eyecon. Built on premium-quality SCII graphite blanks with technique-specific actions dialed in for most walleye fishing applications, the new Eyecon rods are a primo walleye tool. Give it enough time and things in life tend to work themselves out. And hope springs eternal once you lay your eyes on the all-new St. Croix Eyecon. Built on premium-quality SCII graphite blanks with technique-specific actions dialed in for most walleye fishing applications, the new Eyecon rods are a primo walleye tool. Each features Batson Forecast hard aluminum-oxide guides with double-plated black chrome frames protected with two coats of Flex Coat slow-cure finish. When it comes to premium, affordable walleye rods, the bar has officially been raised. Fuji IPS reel seat/black hood on spinning models. 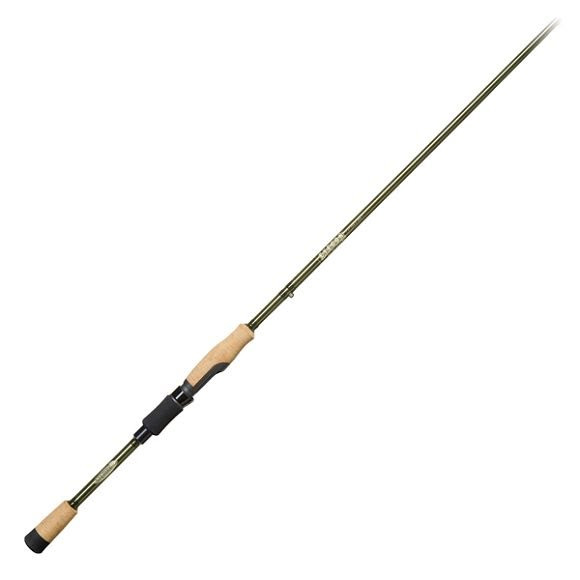 This two-piece version Riggin&apos; rod handles all the applications of the one-piece model plus provides added convenience. Premium, mid-modulus graphite fiber with a higher strain rate than fibers commonly used by other rod manufacturers. This is our most popular material that produces rods that are highly sensitive, lightweight and durable. It&apos;s an outstanding choice for anglers who appreciate high performance without high cost.